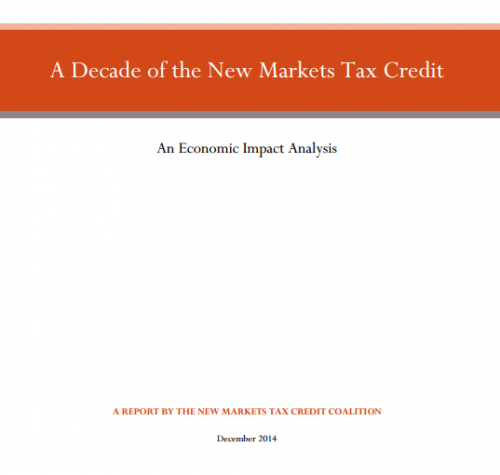 The New Markets Tax Credit (NMTC) was enacted in 2000 as part of the bipartisan Community Renewal Tax Relief Act (P.L. 106-554), which then President Bill Clinton called "the most significant effort ever to help hardpressed communities lift themselves up through private investment and entrepreneurship". After decades of using grants for general economic development, Clinton – and his partner across the aisle, Speaker of the House Dennis Hastert – chose to use the tax code as an economic development tool, following the cost-effective model of the Low Income Housing Tax Credit. The findings in this report show that between 2003 and 2012, NMTC created nearly three-quarters of a million jobs, generated well over $100 billion in economic activity in long-distressed communities, and expanded the tax base of state and local governments. In short, the research found a significant return on NMTC investment to federal taxpayers. Over the years as the program has matured, NMTC financing has increasingly gone to rural communities, areas experiencing severe economic distress, and community facilities like healthcare clinics.